Welcome, all of you... and especially, today, listeners from this morning's Fred and Jeff Show. I'll be a guest on the second half of their show this morning — and (later) in a podcast you can hear online. First, here's a mailbox photo for you. Then, some tips to help you find mailboxes on this blog. 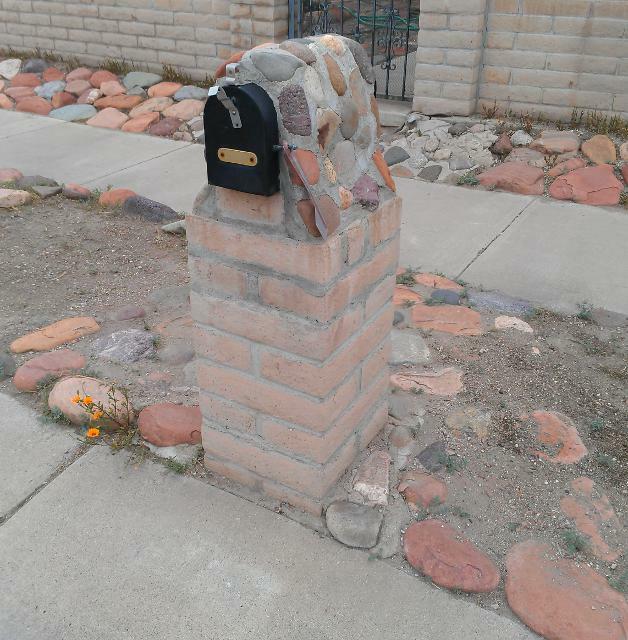 This black mailbox, on a brick post, is covered with multicolored rocks (like its surroundings). Now, about this blog. If you're wondering why I ever started taking photos of mailboxes, have a look at About Tucson Mailbox Art (or click on its tab at the top of every page). I don't show every unique-looking mailbox I find, though. You can read why — and get a list of these “boring” mailboxes — in Not these mailboxes (or by clicking its tab). A ways down the right column is the Blog Archive. There you can find earlier mailboxes — back to the date I started this blog, 12/12/12. Type an address or a street name, a color, or something else about the mailbox in the search box at the right side of any page on this blog. Thanks for stopping by! There are almost 170 mailboxes on this blog now, and I try to add a new one every day.